March 2019: Saving Mount Rushmore named as one of the finalists for the 2018 Selah book awards – middle grade category. Saving Mount Rushmore is a middle-grade adventure novel released by Anaiah Press as a paperback in April 2018. Can he embrace his God-given gifts in time to save Mount Rushmore? When John Jenkins’ parents ship him off to stay with his aunt, he’s certain it will be the worst summer ever—until he learns he’s been accepted to a top-secret school. St. Michael’s Academy is home to gifted students with extraordinary talents. Although John has no idea why he’s there, he’s assigned to Team Liberty, who assist authorities with low-level crimes. 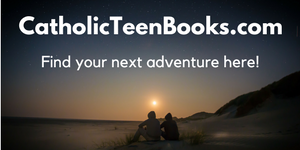 Their first mission: stop a trio of mischief-making teens from vandalizing Mount Rushmore. John battles feelings of inferiority as he and Team Liberty compete against Devlin Black and his cronies to track down clues and solve puzzles at Mount Rushmore. Along the way, John makes several key contributions, and his self-confidence grows. When he discovers he was admitted to the school due to a clerical error, he’s mortified. Now, he’s strictly an “observer” until the mission’s end. But when his teammates run into trouble, John must summon up the courage to try to save Mount Rushmore, and he learns an invaluable lesson: every person has special God-given gifts—including him. Imagine a magic mirror capable of transporting a person from one place to another. It sure would make life easier, but if you are a typical, somewhat clumsy thirteen-year-old like John Jenkins, it’s a good idea to work on your landing to avoid embarrassing yourself in front of your new friends. Especially when these friends are part of a special team of crime fighters preparing for a secret mission. In Saving Mount Rushmore by Andrea Jo Rodgers, John finds himself in an unexpected situation when his parents travel to Africa on a medical mission and send him to stay with his great-aunt Martha in South Dakota. His plans for summer vacation had included surfing at the beach on the New Jersey shore and visiting amusement parks with his best buddies Chloe and Jackson. What in the world will he do in South Dakota? Rodgers does a great job of presenting a believable protagonist. The book is written from John’s point of view as a third-person narrator, and he is truthful in admitting his insecurities, revealing his shortcomings, and for the life of him, not at all able to understand what could possibly be his own God-given gifts. He seems to be a typical, ordinary teenager. So it is a complete surprise and somewhat dismaying, when John discovers upon arriving at his aunt’s ranch that he’s been chosen to attend Saint Michael the Archangel Academy. After all, attending summer school is definitely not a vacation. “It’s a top-secret school that helps authorities fight crime,” according to Aunt Martha. All of the students have special talents and are divided into teams with the purpose of completing secret missions to “fight against evil to protect our nation.” The school’s motto is For God and Country. Thus John soon realizes Saint Michael’s isn’t any ordinary school. The next day John and Aunt Martha travel through the magic mirror, and John’s adventure begins when he meets his Team Liberty partners. 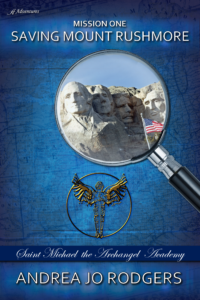 The novel is fast paced and takes logical twists and turns as the team works to complete its mission against Devlin Black and his evil cronies who are out to cause trouble at Mount Rushmore. John, Annabelle, Raphael, and Shaniqua must use their special skills to find clues and uncover the mystery of Devlin’s plans, but the most important point is John’s quest to discover his own talents. Rodgers wants readers to know that everyone has special God-given gifts to share with others, even if those gifts are not easily recognized. What I like best about this book is the manner in which John is seen as a hero. He saves the life of a park ranger by pulling a soggy piece of bagel from the man’s throat when he’s choking. Ewww! He encounters Mr. Gibbons, the escaped monkey, in a bathroom scene where John gets the bad end of a paper towel fight and has to meet his supervisor with wet pieces stuck in his hair. No way is John a super-hero as they are depicted in our present day. He doesn’t have superhuman powers or fly through the air, but he’s exactly the type of boy with whom most young people can identify. He’s awkward, always hungry, and misses his mom, his dad, and his dog. Saving Mount Rushmore is a great book with a strong message of how good triumphs over evil. It is interesting and imaginative, and it includes secret codes that even I as an adult, attempted to decipher. Rodgers provides information about Mount Rushmore, one of the wonders of our world and our country, and she includes websites where readers can learn more.